The House Behind the Cedars by Charles W. Chesnutt is a fictional account of two siblings- John and Rena- who set out to take from the world what it is not willing to give them. John and Rena are of mixed race; their mother was a mix of many races, including African-American, and their father was white (but did not acknowledge them as being his children). John grows up and is unwilling to accept that his fate is decided by a fraction of his ancestry. He changes his name, goes to South Carolina, sets himself up as a lawyer, marries a white society woman and no one is ever the wiser as to his being Black. When he returns to visit his mother several years later, he finds his younger sister Rena all grown up, with very Caucasian looks. He decides to take her with him to conquer South Carolina society, both of them pulling off a dangerous game of passing for white in polite society. Rena is a success and falls in love with a young South Carolina gentleman. But she worries about her deception and the possibility of her fiancee finding out her secret and hating her for it. When her fears are realized, everyone's lives are changed forever. This is more a novella than a full-length novel. It is a simple story told in just over 200 pages. I often feel that with some books, the plot is secondary to the agenda or the message that the author is trying to get across. For me, The House Behind the Cedars is that kind of book. Yes, there is a plot, but you can tell early on how it is going to unfold. And yes, there are several characters, but none of them are so deeply developed that you become attached. Instead, the takeaway is in the message about racism and the constraints and stresses it places on people. One thing this story taught me is just how deeply ingrained, at all levels, prejudice of some sort can be. When you're the bottom rung on a ladder, you try really, really hard to find someone else to look down upon. So while the whites looked down on Blacks in North Carolina, the mixed race people also looked down on the Blacks. The free Blacks looked down on former slaves. The rich Blacks looked down on poor ones, and so on and so forth. I don't know if this is still the case today (with the African-American community in particular- I know it is still true in a general class-based society sense), but it struck me as so sad. To be perfectly honest, the story of The House Behind the Cedars didn't grab me. It was interesting, but not for reasons of plot or character development. I appreciated it more as a historical text, a snapshot of a moment. I think when we look back at history, we see the laws and the rules and the starkness of facts and forget that perhaps things were more flexible than they might now seem. The book mentions that racial segregation became more pronounced after the Civil War, as whites scrambled to ensure they didn't lose their social standing. Prior to the war, they were never worried about losing it and so were perhaps more generous than they were afterward. Now, we look back and think "All Blacks were mistreated." Which is true, of course, but also ignores that "Sometimes white men fell in love with Black women." Or that "People who looked white were treated better than people who looked Black." And all sorts of those in-betweens and in-the-middles that are lost to history because they were not recorded; rather, they were unwritten customs. I think that's really the value of fictional accounts like this one, which refer to societal reactions so casually that the reader can tell that this sometimes happened and was accepted. Historical fiction written today about the post-war years, in contrast, might be much more constrained and rigid because the authors have to draw from sources and documents, rather than their own experience of life. I also liked the book because it was the first one I read about someone of African-American descent who fought successfully against the constraints put on him at the time. John was not a fatalist- he worked hard to accomplish what he did and he wasn't willing to settle for the life most people expected him to have. He hated it when people just accepted their fates as though it was the will of God. As he says to his sister, "God is too often a convenient stalking- horse for human selfishness." John refuses to accept this and it was fascinating to see where that got him. In contrast, his sister Rena seems to think that she is punished by God for thinking above her station, and reacts by trying to help the poor, suffering Blacks that she feels so much (condescending) sympathy for. It was a fascinating look at how two people could control their lives and destinies, and I loved that John was so actively involved in succeeding in his own life. While I don't think this story fully engaged me, it was a very fast read and one that brought to my attention the gray areas of race relations in the South after the Civil War (much like The Help made more clear to me the racial distinctions of 1960s Alabama). 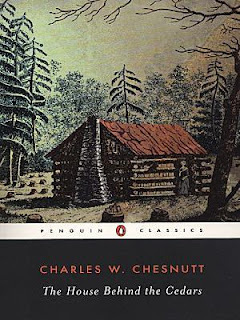 I enjoyed reading the story, and I hope to read more Chesnutt in future. Note: This book is written with dialect. It can be hard to work through with all the apostrophes, but I think you'll manage! I read this book as part of the Classics Circuit, which focused on the Harlem Renaissance in February. Is it good, the dialect? I mean, when you read it, does it sound natural? Jeremy Love and Alice Walker both do dialect really well, but some other authors don't manage it quite as nicely. It sounds good, but nothing compares to The Help for capturing those moments, in my opinion. This sounds really good. Did you ever read or see the movie Show Boat? It is also about a woman of mixed race who tries to pass, and the heartache that results. Also, you probably know about the case Plessy vs. Ferguson, which was the separate but equal case, concerning Homer Plessy who was one-eighth black but was not allowed to sit in the white section of the train. It all seems so incredible now but I think you are absolutely right, when you wrote that "When you're the bottom rung on a ladder, you try really, really hard to find someone else to look down upon." I think this always has been true for some people, although the people designated to be at the bottom changes! Blodeuedd- Glad to be of service :-) Don't worry- my next couple of reviews will be fantasies! Jenny- I think the dialogue is good, but I am no real judge. At least, when I read it in my head, I could figure out what they were saying. What you said about the "tiered" prejudice thing sounds very similar to what was in Their Eyes Were Watching God by Zora Neale Hurston. The main character was half white half black, and so when she went to live in this one particular community, she was treated as something extra special. There was another woman who was half white half black, but the MC had more anglo-ish features and so the lady deferred to her while snubbing black-only people. It was interesting because I'd never heard of tiered prejudice. Great review. I have never heard of the author but will dd this to my list, even though I have a hard time with most books written in dialect. Have good week! I like the idea of history losing sight of flexibility. I think it must be true, but it never occurred to me in those terms. Amanda- I hadn't, either! Or I guess I had a vague idea of it, but didn't know how tiered it was. It is pretty sad. Trapunto- Yes, I think it is very true, when you can only look back on things that were written, and not on things that just occurred and were not commented upon. It's great to have books like this as evidence. "I think that's really the value of fictional accounts like this one, which refer to societal reactions so casually that the reader can tell that this sometimes happened and was accepted." I completely agree, and I want to read it for this alone! I really want to read some Chesnutt! Thanks for this review. I hear what you are saying about some books being for the message and not the plot, sounds like an ok thing in this case. I just read a book about passing (The Autobiography of an Ex-Coloured Man), and it's definitely something I'd love to explore more in literature. So I *really* want to read this now! Nymeth- Yes, it reminded me a lot of our discussion of Dear Enemy and how the story itself is interesting from a historical perspective (though horrifying in other ways). Rebecca- Thanks so much for organizing the Classics Circuit! I really enjoyed participating and learning about so many authors I have never before encountered. Eva- I love reading books in a short period that revolve around a central sort of theme! I had several previously that centered on mental illness and it was great getting so many perspectives on that. I have recently been coming across quite a few books about race, and in particular about people from other races "passing" as white. I think it's a really interesting phenomenon and one that seems to have a whole lot of ramifications and issues within itself. I think that although this was not one of your favorite reads, it still sounds really interesting. I'd like to read about the different choices that both the brother and sister make, and try to discover more about the issue. Very perceptive review, it looks like something I will have to try. I really like the sound of this book; thanks for your great review Aarti. I am currently writing my MA thesis and I am writing on this novel for my first chapter. I really like your review especially when you refer to the characters development and the way the reader does not become too attached. I loved the book and I am enjoying writing on it. Chesnutt's underlying idea for the novel was to promote miscegenation but there are so many ways in which he does this. When you read further into the novel it becomes a much bigger worls than we first percieve it to be.